The damn thing looks like a lot of fun to me and reading is only of its supported activities I'm looking forward to. It does look like a lot of fun. I plan to use it to watch reruns of TV shows on NBC.com and Hulu. I wish it were right. Only 10% for printing and paper??? first of all, it always depends on how many copies they print from that book. I just know magazine printing where this cost of printing and paper, especially the paper is the biggest part of all costs. I used to work as a print estimator and can honestly say that 10% of selling price is about right, in large quantities of course. Short runs cost plenty because of set up costs. The more books printed, the cheaper per unit costs are usually. Sometimes it pays to order more or even a little less quantity in order to meet the production requirements of paper, labor, shipping, pallet capability etc. as not to cause waste and get the best price per unit. No use sending a truck 3,000 miles with just one pallet on it. Amazon reluctantly agreeing to sell most hardcover releases between $12.99 and $14.99. Amazon, however, noted that it felt the prices were "needlessly high." I think the prices are high as well, but if publishers allow people to RENT books at reasonable prices, a major game changer to be sure, then I welcome the higher "to buy" prices. With Steve's announcement that "people don't read anymore", I highly suspect we will see some sort of renting option in the iBookStore coming soon. Right now publishers are re-arranging their prices to reflect the new rental prices, if they rent a book for $7.99 and Amazon sells it for $9.99, it won't make much sense to many to rent. So Amazon is getting broadsided, but they realize what is up now and is making changes to compete I'm sure. It's just hasn't got any press yet. I think publishers will like renting because they can yank the content off the device routinely, before it builds up enough that people will find a way to hack it off and P2P it. It will also allow people to buy cheaper, less storage models of the iPad as they are not going to retain their content. Apple can continue to make even thinner and smaller devices, which fetch high margins. The sooner Apple starts using SDXC, the better in my opinion. SSD are obsolete already. Renting of books, like a Library, will give lots of people access to content they normally couldn't afford, it will sell a lot of iPads and Steve Jobs will make a significant mark on history. Sure, but then you are leaving out other benefits like being able to carry a few weeks worth of reading on vacation for a fraction of the weight and space. This should not be discounted as an advantage. I used to carry around 25 or so full length novels on my Sony Clie, circa 1998 or so. I now use my iPhone for the same thing (and for movies too). eBooks are great. It's been a while since I traveled, but AIR, Airport stores charged a premium for the convenience of last-minute purchases and had a very limited selection. With a reader like a Kindle or iPad, I have [relatively] unlimited selection at a [relatively] fair market price. With 2-3 business trips per month, I could easily recover the cost of the reader in a few months... and have what I want when I want it! i can also read books on my iphone. i have something like 100 free books from the kindle store that i "bought". no need to spend an extra $500 for an ipad just to read books. Why Apple fix music price but not book price? Double standard? It's not the same situation at all. Before iTunes, music sales were being lost to piracy and no one was making money. Apple correctly identified the reason for piracy was about choice as well as cost ... you didn't have to buy a 12 song LP just to get the 3 songs you wanted. With the print media you want the whole book, not just a few chapters and piracy is not the huge problem as it was for music. For the most part, people are willing to pay a fair price for content, as was proven by the success of iTunes. Now all that has to happen is for fair pricing to be established by the marketplace .... so, if everyone "votes with their wallet" that will happen, but please remember, what's a "fair price" for you may not be a "fair price" for the masses ... so be prepared to live with the majority opinion. Download.com lists 198 hits for "ebook reader" in windows, and 16 for Mac. Facts are easy to discover in today's world. No need to rely upon what you remember hearing. I knew there were ebook reader programs for computers, but that wasn't the real question. I think maybe you missed something apropos to this conversation, which I would have thought was implied because of the context. How many are compatible with Apple's ebooks? Please explain how I can look up compatibility with a product that are compatible with something that isn't available and might not be finalized yet anyway. I know Apple is using ePub, but ePub is compatible with DRM. So far that I've found, Apple's books will be locked down. Some people will need the larger type size the iPad will offer. I suspect there will be a renting option, where it has a time limit and can't be transferred. Also a pay option, which it's yours to save and transfer to whatever medium you choose, share amongst five machines or something like that. If the app store is any indicator, it keeps track of your purchases and allows you to re-download free of charge-- doesn't appear to be a limit to the number of times. You can also do this, to some extent, if you lose Music store purchases-- though you have to call Apple. I have books, including Kindle books, on my iPhone. One advantage is that if you have several iPhones, the whole family can be reading the same E-Book at the same time. The problem with books is people want to rent first then buy if they judge the content worth retaining. There are many books out there that have nice covers, but the content is just about worthless. This wouldn't be that bad if they dropped prices to half the price of the paperback once the paperback version was released. I don't buy hardcover books anyway. Hopefully the model is half the price of whatever printed version is currently available. All the focus is on new books in these articles, how much are the older books going to cost? why does it matter if they are compatible with Apple's DRM which they are not,, even if they use ePub. it's the same book. it's not like the Steam or Gamestop version of a game with special content. It's the same basic data, but if it's not a compatible coding or encrypted, then a purchase from Apple won't be widely useful. I think it's a valid consideration here. I have revised my original post to specifically state Apple, I didn't think I needed to spell it out. 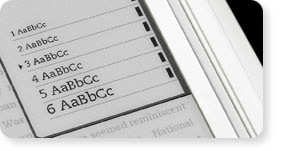 Kindle does offer adjustable text size, would the largest still be too small? that's why i still prefer DVD's and blu-ray to itunes and the other online stores. and other DRM'd media. i played with FictionWise last year and it supported a variety of devices. you download it on your PC. not sure about a Mac version. connect any supported device by USB, register it and transfer books via USB. it supported a lot of readers from different manufacturers and a lot of cellphones. and the NY Public LIbrary supported it so i was able to borrow books with it. I agree totally. I've been considering buying an ebook reader recently. The iPad was in the running until now. Kindle here I come. Screw you Mr. Jobs. Judging from your posting history you won't be missed .... want to make my day? ... get lost. Basically, you pay a monthly subscription for a bookshelf with a certain number of slots. 1) you can add items to the bookshelf as long as you have open slots (most books take 1 slot, but premium books take 1, 1.5 or more slots. 2) once on your bookshelf, a book must remain for a period of time (usually, a month) before it can be removed to free up slots. 5) you can purchase hard copy of your rentals at a reasonably discounted price. 6) You are limited (by the subscription) to the number of concurrent accesses (logins). 7) The cheapest plan is $10 and allows 10 slots and 1 concurrent login. The O'Reilly Safari library is, largely, computer-related technical books. I find it a valuable resource for learning new technologies (iPhone SDK Programming) or as a source of technical reference material. It would appear that O'Reilly Safari and the iPad are made for each other. Why should an eBook 'paperback' be only 50% of the cost of a printed copy? Printing, warehousing and distribution accounts for nowhere near 50% of the cost of a book. I think many people believe that printing a book is expensive on a run of 10k plus - it's really not, normally less than £1 per book for a 200 page paperback. So maybe £2 - £5 less than the RRP for a paperback would be nice (to also account for reduction in fees for distribution and warehousing), but half price is too much, particularly when sales of eBooks will cost publishers lost revenue on printed material. People are entitled to make money for their work, whether creating, editing, proofing or marketing. I can't understand, will never understand, this mentality that music, literature, movies bought on line are somehow worthless and not worth any where near as much as walking to the shop and buying a CD, DVD, Blu-Ray or a book. It's a selfish mentality. You are paying for the content, not the medium in which it is delivered. People seem to want everything for nothing, but expect to be paid well for their own work. Variable price with the publisher - not the distributor -in charge is a good thing. It enables publishers to offer special prices and to have variable pricing for older material - which would not be the case under a fixed priced system. Apple worked hard on this model with iTunes, fighting tooth and nail against music publishers. Apple don't receive enough credit for fighting to remove DRM and introducing variable pricing to the iTunes store. Always criticising gets boring eventually. if i wanted a vacation book i would buy something in one of the airport stores while waiting for my flight. one or two paperbacks is enough. no need to take 20 books with you. well, for you, then, stick with paper books. For me, 2 books doesn't come close to cutting it for 10 days on Cape Cod. Neither is there any airport involved. Sure, I can fill a bag with books, it is what I have always done. Except that last year, those books stayed in the bag as I burned through several experimenting with Kindle for iPhone. I expected to hate it, but I am now considering e-books as a plus to getting the iPad. Notice, I'm saying what I would like--you are trying to tell me what I should want. Or not want. Thanks. I heard the same thing said about the iPod in the early days - who wants to carry a hundred albums around with them?! We do have wi-fi outside the US you know, so I can't think of a single iPad feature which wouldn't work when outside America.